The Green Thermal Energy–TWIN ENERGY PLUS Chiller Hot Water Generator (CHWG) represents an exciting development with regard to providing low energy cooling and heating for industrial, process and HVAC applications. We transfer valuable energy from cooling directly to waste and importantly we do not normally attempt to recycle this high cost waste energy from cooling. The GTE–TWIN ENERGY PLUS Chiller Hot Water Generator enables this waste energy to be recycled and used again on site to supply either a hot water or heating system. Existing or new facilities can now benefit from significantly reduced energy costs by incorporating a TWIN ENERGY PLUS system into their installation. 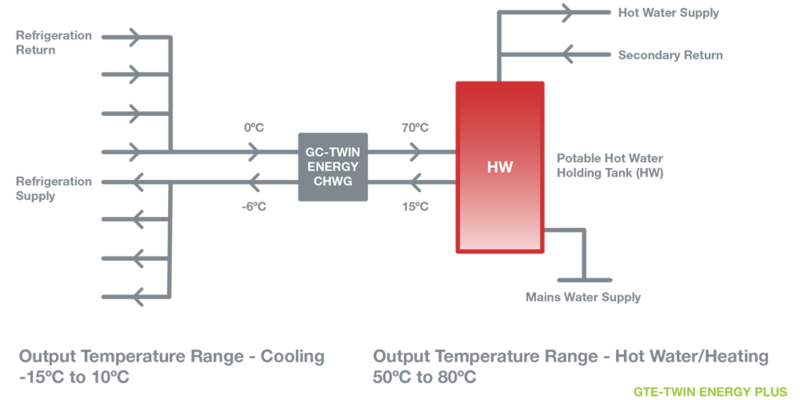 In basic terms the GTE-TWIN ENERGY PLUS provides simultaneous cooling and hot water or heating outputs using significantly less energy than would normally be required. For example if an application requires 100kW of cooling and also requires 100kW of energy to produce stored hot water i.e. total 200kW, the TWIN ENERGY PLUS will satisfy both requirements but will only require the input power to satisfy 100kW of cooling i.e. circa 30kW. This is achieved by an innovative CO2 refrigeration system that combines both cooling and heating outputs; this system recycles the maximum amount of available waste energy to meet the required demand. 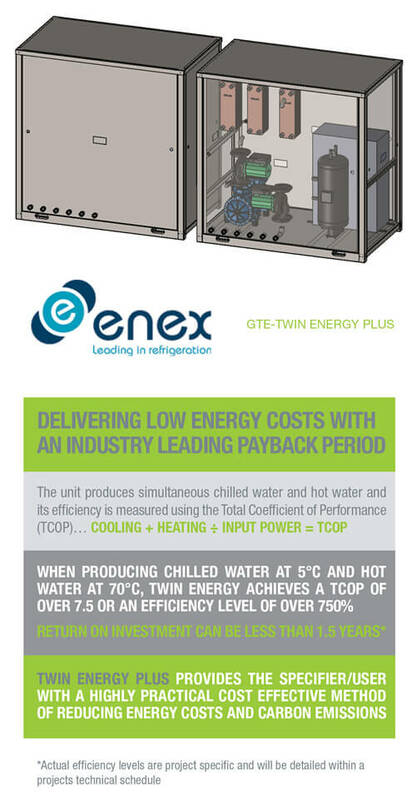 The GTE-TWIN ENERGY PLUS UNIT allows the cooling input energy to be used twice, but importantly the recycled second time use energy provided for hot water or heating production is virtually FREE and virtually ZERO CARBON. Even when there is no demand for heating or hot water the GTETWIN ENERGY PLUS system can be specified to efficiently provide chilled water or direct cooling. Depending on the particular requirements of each application the unit can be configured to recycle 100% of a cooling demand or it can be configured to reject heat to atmosphere as per a conventional Air-Cooled Chiller or Condenser. The GTE-TWIN ENERGY PLUS provides a practical and proven means of producing cooling and hot water or heating 52 weeks of the year. The practical potential for both new and retrofit-replacement applications means that the TWIN ENERGY PLUS is becoming an attractive alternative to expensive and high energy use direct gas and electric hot water production. The second time use of recycled energy is now recognised as being of higher benefit & value than energy produced from renewable means. Why accept waste when valuable rejected cooling energy can be recycled & used again on site by installing a Green Thermal Energy TWIN ENERGY PLUS system.